In Tunnel-Realities and Imprints (201) Bob takes his first big stab at using words to describe something which by its nature cannot be understood by the rational mind, using the model to explain the meta-model as it were. RAW has been building up to this point for 200 pages. If the final secret of the Illuminati has yet to be revealed, 8-Circuit Theory may be the puzzle that points to that final epiphany. Bob affords it that space in the structure of this book that changes people’s lives. This mystery of mysteries is the gift that keeps on giving apparently. Bob can’t seem to stop talking about it. It serves as a scaffolding for all of his subsequent work; the biggest, widest, wildest tunnel that he is ever blessed to view from, continually expanding and morphing not unlike Universe, impossible to pin down because it won’t stay damned still. Over the course of his career post-Illuminatus! 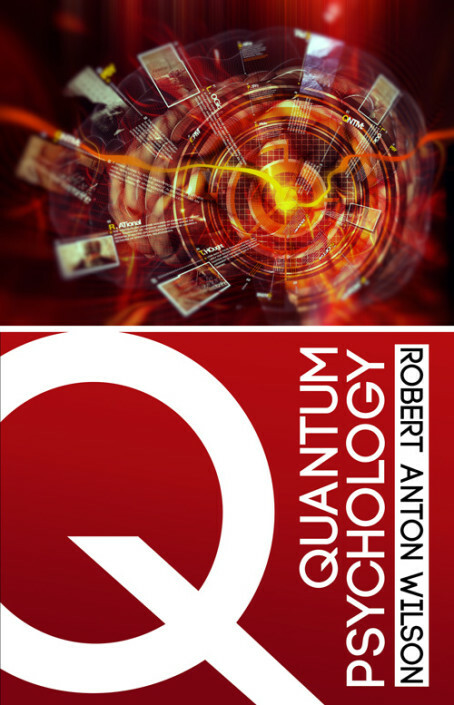 RAW kept coming back to 8-Circuit Theory, re-naming, re-ordering, and refining his understanding (and that of his readers). The chart below details a bit of this expanding/contracting/morphing—the shift in naming and ordering between 1977 and 1990. Digging into this initial iteration of The System/Circuits According to Raw, I am faced with 2 frustrations. The first is my attempt to “understand.” Given that the system itself describes and advocates the use of 8 different “modes of being” it doesn’t make a lot of sense to obsess on grasping it solely through the use of my “thinking facilities,” and yet it is so hard not to. That’s what my thinkers like to do—figure things out! The solution I have developed in that regard is to simply view the system as a tool for discovering how to operate my nervous system. A map, and nothing more. Pull it out, have a look, fold it back up and put it away. Now go play in the territory. Of course, having a good map is quite useful when navigating unfamiliar territory, and quite useless in Chapel Perilous, which is by definition that place where none of your maps is accurate. The awesome thing about 8 Circuit Theory, the System that is not a System (said Ouspensky on his deathbed), is that it is not just a map. It is also a telescope and a microscope and perhaps the most awesome mental multi-tool ever. As such, it is designed to be USED more than UNDERSTOOD, played with more than figured out. So the solution to my first frustration is to play with it (which includes, apparently, feeling free to re-name and re-order (and re-make/re-model) at Will), use it to look deeper into the world as well as to step back and get a broader perspective. Swiss Army Knife. My second frustration lies in finding a more helpful way of viewing and working with Circuit/Systems 5-8 than through the terrestrial/extra-terrestrial lens. All Reality Tunnels have their limits and given my Earth-Bound Existence that particular dialectic hasn’t really served me for something like 25 years. It’s like waiting for the dog-mad Eschaton to bleeping Immanentize already! I can’t live in that space! What I’m doing now is viewing THIS as the time of systems 5-8. I see this in how the on-line world, the social-media, are actively transforming our culture—the culture wars are being fought on-line, in the Neuroelectric/Meta-Programming circuit. As people self-select culturally, they are also then creating new gene-pool swarms. We can see how the Morphogenetic system pulls people of various DNA configurations toward each other. Well anyway, that’s my game. What’s yours? Be here next week for more of this craziness: The Octave of Energy (214) and The law of acceleration (219). Chas: I find it interesting that you're modeling circs/systems 5-8 as "now." I sometimes do that, but it seems an easy guess that almost all of us who have immersed ourselves in the 8CB Model use it in wildly idiosyncratic ways. I recently read a few articles on DNA methylation and thought, "this is being called 'epigenetics' by geneticists, but I'm thinking of it as an addition to the Neurogenetic Circuit." When I read about NDEs I think of the 8th, but probably many of you would object. I also read recently about nanotech and inroads in medicine, which I see as an 8th circ idea, but anyway...) And that's the point: the Octave, as laid out by Leary, was interpreted by the far more generalist-erudite RAW. In this Leary has performed a classic move of creative intellectuals: according to sociologist Randall Collins, in his magisterial _The Sociology of Philosophies_, one of the most creative things a thinker can do is to create intellectual "space" in which later thinkers can think. At first the thinkers are from the inner circle, but if the ideas are good, they spread far and wide. I think Leary's championing RAW for the 8CB Model is an understatement: RAW's elaborations are so erudite and florid and trippy it's one of the main features of his total oeuvre. 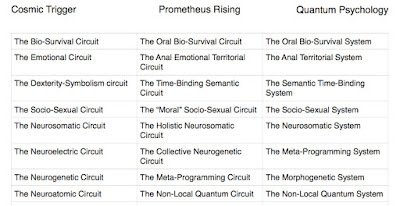 I, too, appreciate viewing circuits 5-8 as manifesting now. When first studying the system it was hard to hang on to the cyberdelic vision of a possible future when it was not my immediate perceived reality. As time went by I moved on to other grids. This section of CT introduced me to Leary' s 1970's work. Prior to this I'd only read The Politics of Ecstacy, and thought the the Seven Tounges of God was a personal revelation. I went on to collect many Leary and Wilson books, by never fully integrate the system into my life. With the recent 're-release of Prometheus Rising I have determine to finally work my way through the exercises and internalize the system. There is one significant change I have made in my approach which is to try to follow the "spirit" of the exercise instead of the letter. For example: I. I would find it difficult to attend a massage and sauna once a week due to time and money, but I have a whirlpool tub. No aquariums are close, but I can keep a small fish tank as a hobby. II. I won't be visiting a zoo soon, but Animal Planet network has shows about lions on often.....Trying to follow the letter of the exercise held me back as a young man, but by putting a personal spin on the exercises and interpreting the circuits through current life circumstances has allowed me to make much more progress. Lately I've been trying to integrate and balance the four lower circuits through daily activities. Maybe in a couple of months I'll feel ready to start on circuit 5. I think we're certainly going through a time of upheaval, when aren't we though?, but I have a hard time qualifying this period as a meaningful development of the right-brain circuits. I can entertain the notion that more people moving into the "post-terrestrial fifth circuit hedonic-engineer" role in droves, thanks to the proliferation of entertainment technology and the more identity based perceptions of the world. However I'm not sure that many, including myself, are doing much beyond navel gazing. Wilson does talk about how one can use and abuse the fifth circuit, where momentary pleasure becomes more important than sometimes painful development. A conversation I had a couple years ago in a hotel room with a close friend that concerned what life would be like if someone were perpetually "on" the sixth circuit and upwards of there. It was a oddly haunting as we both hazarded that such a person would be well beyond ordinary humanity and would need some sort of ascetic lonely lifestyle. Just a thought. I've worked with the eight-circuit model almost a long as the kabbalistic tree of life and have found it perhaps more useful. I base a lot of my first impressions on how I interpret someones second-circuit development and fifth-circuit development. At the very least, those are the terms I choose to conceptualize my impressions. It has also led to a regrettable personality trait I can only describe as "fifth circuit chauvinism." I've always been skeptical of the higher circuits and have occasionally raised my eyebrow at some of the examples that RAW occasionally throws at the reader. I feel like what I've written is rather pessimistic and limited in perspective. Hope it is of some interest. In academia, there seems to be no widespread conceptual scheme for discussing non-ordinary brain states. If you find something among official academics, the disciplines are so balkanized they can't integrate it. The idea that, historically, you had to evolve to a sufficiently wealthy/comfy leisure class in order to activate a enlightened hedonism and Mind Your Own Business-ism? That makes a ton of sense to me. 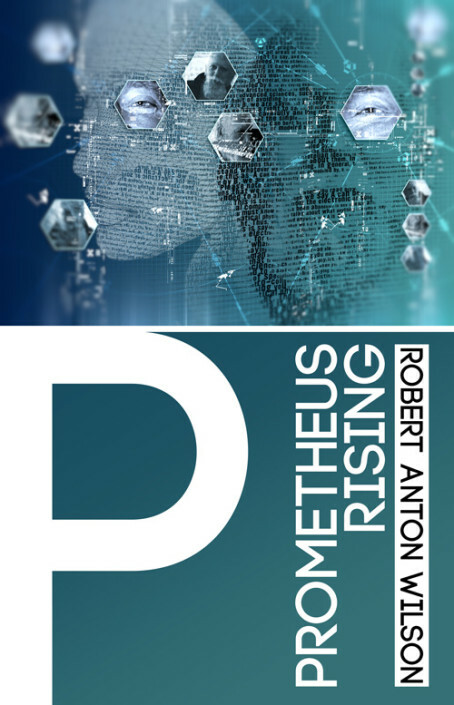 Also, "metaprogramming" as elucidated in Prometheus Rising? That also makes a lot of sense to me. The neurogenetic archives and atomic circuits (for me: 7th and 8th) seem inchoate in their elaborations, but I still pay atention. The Fascinating Finn Antero's idea that you need a healthy 1st circ in order to get the 5th going in a happy way: that makes a lot of sense to me, too. Also: RAW's riffs about 3rd circ people vs. 4th circ people? A "dialectic"? I can't help but see that every effing day in the MSM's "news" about politics. Makes a HELL of a lot of sense to me. I remember visiting the Federation Trading Post in Berkeley in the 70's, and I owned the Enterprise blueprints. Do you guys think it's possible that music, without any substances involved, can produce Fifth Circuit rapture? I went to a live performance of Beethoven's ninth symphony a couple of years ago, and some of the music produced a sensation in me that I was floating. It seems to me that music primarily affects the first and fifth circuit. The type of music, or tones and rhythm used determines the specific effect. By relaxing the first circuit, fifth circuit experiences are activated. Tom and Dustin--music is powerful! Go to a punk show and check out the circuit 2 ritual. Put on some Bach and watch the ideas pour onto the page. music can stimulate all of the circuits, imo. 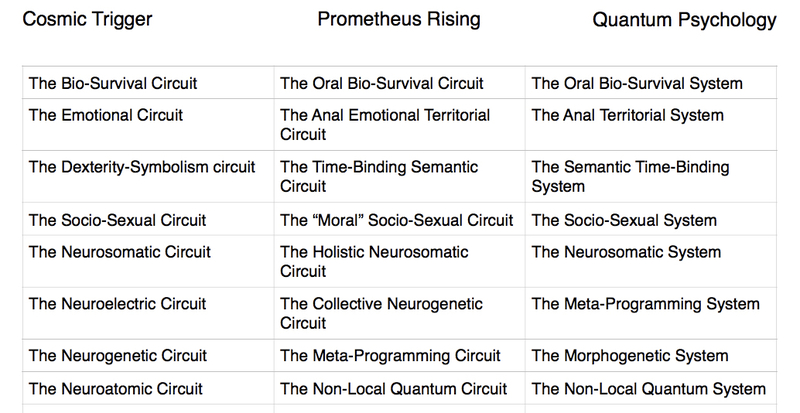 In “The Game of Life,” Leary has 3 stages for each of the 8 circuits making 24 stages in all, and this is week 24 for the Cosmic Trigger group. I found the 8 circuit model absolutely brilliant when I first discovered it . Its structure helped me to sort out the often chaotic intensity of being in your early 20s. Over the years, I've found it most useful for purposes of communication. I don't use it much in a practical way anymore, that is I don’t work on, consider or measure things according to one or another of the specific circuits. Its theoretical value outweighs its practical use, for me. I see C5 as a higher form of C1, C6 as the advanced form of C2 etc. This formulation appears hinted at in the C6 section of this weeks reading and I believe it gets more developed elsewhere. I view all the circuits as “on” at all times in various degrees of activity or dormancy. I see the circuits as operating in parallel rather than a series of successive states. One’s state could be thought of, in this model, as a mix of the different circuits. You can look at it like a mixing board with each circuit operating like a fader at a different level. The be a dominant circuits. On this metaphorical ontological mixing board there might be a point in the fader level called threshold of awareness. Faders for the higher circuits for most people most of the time don’t cross the threshold of awareness, but I don’t know if that means they’re completely inactive. They might be operating below this threshold. Some phrases that have qabalistic interest: p. 206 – in the section on C5: “ … including even complete blueprints for the starship Enterprise.” I grew up and was a huge fan of the original Star Trek. p. 208 talking about C6: “It is charmingly simple and obvious…” … “Circuit VI is the “universal translator” often imagined by science fiction writers …” Tiphareth the 6th Sephira on the Tree of Life fits the description of universal translator (look at any diagram of the Tree of Life). While I agree that sociologically the current struggle goes on between C4 and C5, I see the next occult/artistic leap of evolution as going from C5 – C6. When C6 gets activated, established and crystallized in a balanced way by enough people then we’ll see the advent of Nietszche’s Super Humanity. I agree with Chas that music can affect all the circuits. There might be a correlation between certain kinds of music and specific circuits.